MANY mourned the loss of German Moreno after one of the Philippine entertainment industry’s pillars died of cardiac arrest on Friday morning at age 82. 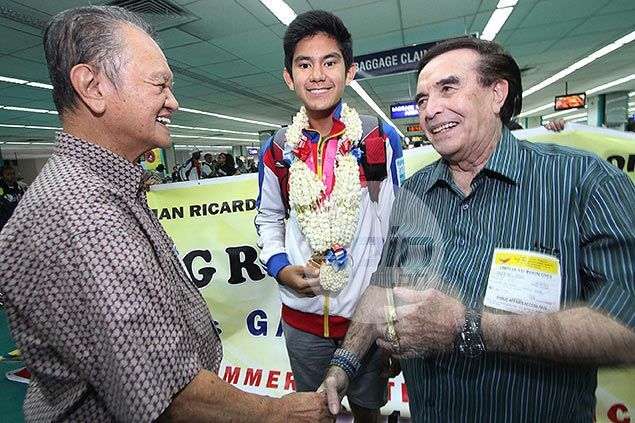 But the pain is deeper for the family and close relatives of the man known as 'Kuya Germs,' including his grandson Luis Gabriel Moreno who is an accomplished archer and the first Filipino to win gold at the 2014 Youth Olympic Games. "Maingay sa loob (ng ICU). Talagang iyak ng iyak ‘yung mga bata everytime na nakikita nila ‘yung monitor,” said John Nite, nephew of the elder Moreno, in a radio interview over DZBB, referring to the archer. Nite added that the reaction of Kuya Germs’ grandsons is just natural especially considering how their grandfather was very supportive to all of them. “Dapat ilabas nila (‘yung emotions nila) dahil mahal na mahal nila ‘yung lolo nila in all aspect,” said Nite. Although his grandson didn’t go into showbiz, Kuya Germs gave his all-out support to the now 17-year-old Gab. He was one of the first persons to meet Gab at the airport following his feat at the Youth Olympic Games, where he teamed up with Li Jiaman of China to capture the mixed international team in archery. Gab’s father, Federico Moreno, is also involved in sports being the president of the Philippine Archers National Network and Alliance (Panna).